To classify and identify igneous rocks we must examine their physical properties and unique characteristics. Although all of the rocks above are igneous and formed from magma / lava, they appear very different from one another. The differences between the igneous rocks shown above can be described largely by differences in their formation. THE ENVIRONMENT OF FORMATION REFERS TO WHERE A ROCK FORMS. 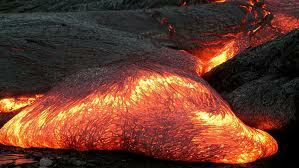 Since igneous rocks form from magma or lava, they can form either inside the Earth or on the Earth's surface. THE ENVIRONMENT OF FORMATION IS IMPORTANT BECAUSE IT EFFECTS HOW LONG THE ROCK TAKES TO COOL AND HARDEN. There is a wide range of possible textures for igneous rocks, from very coarse rough rocks, to very fine smooth rocks. There are even some textures that are unique to igneous rocks. For example igneous rocks are the only type of rock that can have a glassy texture. Similarly, they are the only type of rock that can have vesicular air pockets inside the rock. Obsidian is and example of an igneous rock with a glassy texture. The precise texture of an igneous rock depends on the size of the mineral crystals that make it up. If only we knew what determined the size of crystals...oh wait...we do. The size of the crystal depends on the cooling time! So, if we think about it we should be able to put this all together. Intrusive rocks form inside the Earth. This means they COOL SLOWLY. Which means they have a COARSE TEXTURE! Extrusive rocks form on the Earth's surface. Which means they have a GLASSY / FINE TEXTURE! 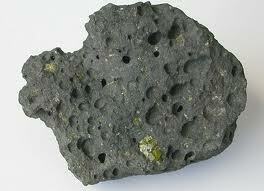 The chemical characteristics of the magma or lava that forms an igneous rock also effect the properties of the rock. There are two general types of magma / lava: Mafic or Felsic. Mafic Magma contains more Calcium and Iron, and less Silicon. This makes it thick and slow moving. Felsic Magma contains more Silicon and Aluminum. This makes it thinner, more fluid, and faster moving. If we know several of the properties of an igneous rock we can use the ESRT Igneous Rock ID chart to figure out the name of the rock. Let's Practice: Identify the rock based on its description.